Based on this comment I thought I would give a little extra tip while answering the question. 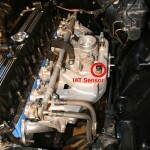 Tony is getting a 112 error code with his 05 TJ 4.0L. Nice thing about the 4.0L, it’s the same in every Jeep it finds a home in. So, while it’s not very common this sensor dies, it is possible. I’ve had it happen with a previous motor swap. The “new” donor motor did have a bad sensor. It’s a quick and painless R&R (remove and replace). If you have an Autozone in your area, the website calls the sensor a “Air Charge Sensor”. Don’t ask, I still don’t get how they come up with different names than a service manual has. Part number is: SU3036 and is price at $27.99. 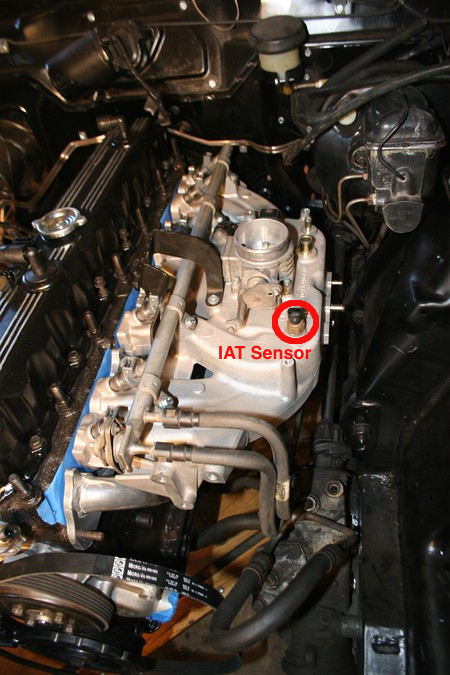 If you click on this picture for a larger version, you’ll see I’ve highlighted the sensor itself on the 4.0L intake. If you feel adventurous, you can follow Dino Savva’s instructions for relocating the IAT to the air box. I personally have not done this mod yet, but I’m sure I will in the future when I have more mods to do under the hood. Right now, it’s bone stock for me. Hope that helps and gives a bit more insight to the IAT.